Nexon has filed a motion against NCSoft to take greater control of the company. 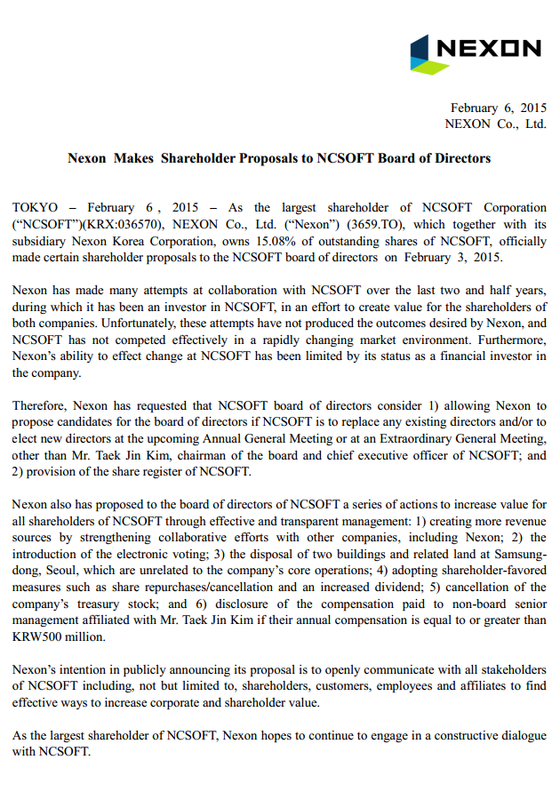 Corporate power grabs are nothing new but I'm surprised at the recent news that Nexon, NCSoft's largest shareholder, isn't particularly happy with the profits that they're seeing. As a result, they've begun to take internal action to remedy the problem. That remedy is to place their own Directors at the head of the table as well as requiring a variety of actions to increase revenue, this includes "strengthening collaborative efforts with other companies" as well as "adopting shareholder-favoured measures such as share repurchases/cancellation and an increased dividend." For anyone who isn't familiar with this sort of speak, Nexon basically want more say in how NCSoft is run and they want more money. As far as I'm aware, this is only a motion that has been tabled to other shareholders and there's no gaurentee it will pass. However, I suspect it will simply on the basis that shareholders always want more money. The only risk here is the fact that NCSoft haven't performed well from one particularly game, notably WildStar, and that will have a direct impact on future dividends. It's unlikely that this motion will affect any profitable games but it isn't particularly positive for the games NCSoft runs that aren't doing so well. We'll keep you updated on any further developments.